Some days my job is so strange. Interspersed between the SysOps bits I could be capturing the Snack Jackals of Clockwork tearing apart a gift basket. Or snapping cute shots of Clockworklings. Or I might be asked to stay late for a “Calves and Asses” calendar photo shoot. Hmmm. We’ll see how that one plays out this afternoon. 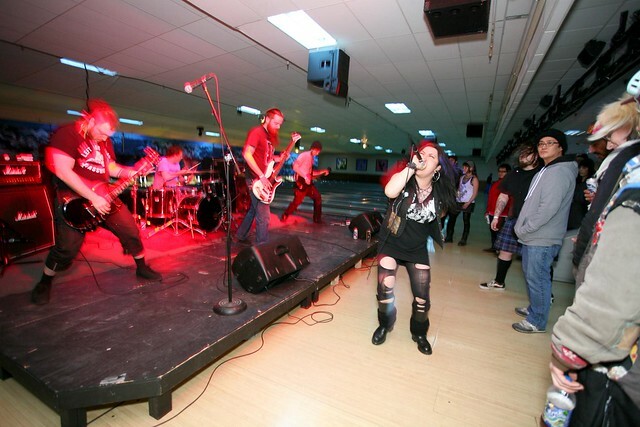 Enjoyed myself last night at the punk bowl at Memory Lanes. Only stayed for the first two bands - Ashen and Rifle Diet - but they gave me that little bit of doom and punk my day needed. Obscura Day is coming up on April 28th, 2012. Locally we have two events - one at the Wabasha Street Caves and the other at Allen Christian’s House of Balls. But daaaaang New York City has it going on. Wherever you may be in the world, get on it. Giving the new Spiritualized some more spins to see if it grows on me, before they come to town on May 1st. But Ladies and Gentleman We Are Floating in Space will always be tops. My old friend Ian has a shiny new web site for his record label, 25D. Check it out. After nearly six weeks away at Canon repair my favorite lens, a 17-40mm wide angle, has returned to me. For just $233. Replacing it would have cost a whole lot more but OUCH. It took us a little while to warm up to one another after being apart so long. There may have been some mutual resentment. But we got over it and have already been doing happy fun things together. And I’m looking forward to more, and better, times ahead. This was written by Sharyn. Posted on Tuesday, April 17, 2012, at 2:43 pm. Filed under Uncategorized. Bookmark the permalink. Follow comments here with the RSS feed. Trackbacks are closed, but you can post a comment.